Scotland, Births and Baptisms, 1564-1950 and Scotland, Marriages, 1561-1910. 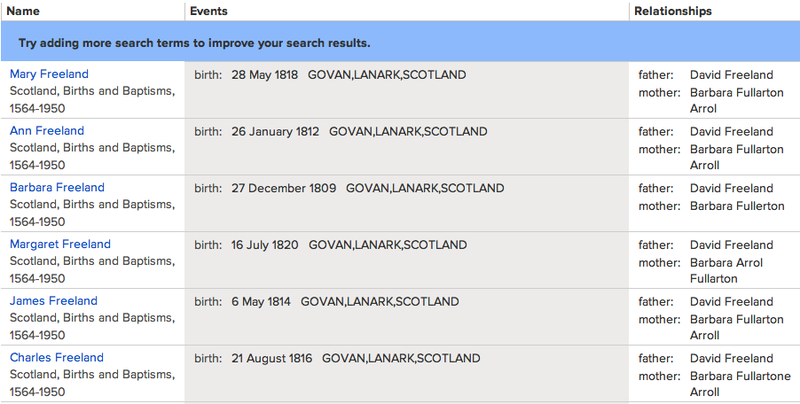 In searching for James and David Freeland, I was able to find that James Freeland was born on May 6, 1814, in Govan, Lanark, Scotland, to David Freeland and Barbara Fullarton Arroll. With that information, I adjusted my search to capture the births for ALL the children of David Freeland and Barbara Fullerton Arroll. I then found David Freeland and Barbara Fullerton Arrol were married on July 30, 1809, in Govan, Lanark, Scotland. I then found indexed birth records for David Freeland and his siblings, to James Freeland and Ann Lang, in Glasgow, Scotland. And indexed birth records for three Arrol/Arroll children for Charles Arroll and Barbara Fullerton in Glasgow. 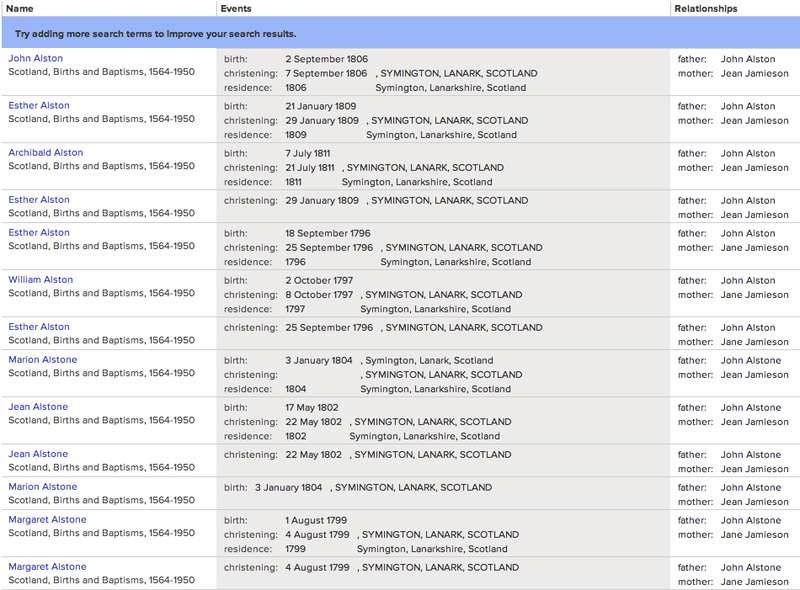 After finding for a birth record for my 3rd great-grandfather, John Alston, showing he was born on September 2, 1806, I was also able to find the eight children of his parents, John Alston and Jean Jamieson (a new name for my tree) in the birth index for Symington, Lanark, Scotland. 3rd great-grandfather, John Alston, married Lillias Johnston on June 28, 1833, in Glasgow. And I found a November 23, 1795, marriage record for 4th great-grandfather, John Alstone, and Jean Jamieson in Covington and Thankerton, Lanark, Scotland. And it looks like I can go back a few generations on these Scottish lines, but will need to do more research to (1) learn more about researching in Scotland, and (2) what records are available. This is a great blog you have here. I look forward to reading more! I'm glad that this post helped you - I was pleasantly surprised to find these Scottish records and look forward to finding additional information.